Nancy de Freitas, aged 8. A couple of weeks ago, I received a message from a woman curious to know why her grandmother was in my online family tree. This is hardly a unique occurrence, since I enjoy tracking down fairly distant family connections. In this case, however, our connection was very close (at least by my standards): her mother was the great-aunt of my first cousin’s husband. I even personally saw my correspondent’s first cousin at my cousin’s wedding! My husband, father, and I were able to represent the Mainland contingent of our family at her wedding on the Big Island of Hawaii. It was a fascinating experience, complete with island customs such as leis, a whole pig roasted in an imu, poi, and miniature kahilis as party favors. What I recall hearing at the time was that the groom’s father was full Native Hawaiian, and when he rose to stand during introductions at the reception, I was totally convinced. His substantial physique and overall appearance looked just like pictures of nineteenth-century Hawaiian monarchs. However, I’m not the first family historian to discover that ethnic attributions are not always correct. It can be tricky doing Hawaiian genealogy, since most public records are not available online. Thankfully, at least the U.S. census reports are. Hawaii became an American territory prior to 1900, so one can currently trace people through as many as five censuses … assuming the spelling is close to correct (which it rather frequently is not). It was through these census records that I discovered more than one surprise. John de Freitas, aged 49. The first was that my cousin’s father-in-law was not full Native Hawaiian. His maternal grandfather, John de Freitas, was born on the Portuguese island of Madeira, and his maternal grandmother, Virginia Gonsalves, was born on the Hawaiian island of Maui shortly after her parents arrived from Portugal. All of a sudden, my cousin’s father-in-law was half as Native Hawaiian as I’d thought! The other thing I discovered was that my cousin’s father-in-law had been born on the island of Molokai, where his parents met as patients in the “Territorial Leprosarium” at Kalaupapa. 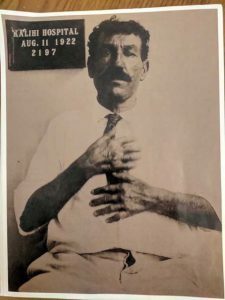 To prevent him from contracting Hansen’s Disease, it appears that he was taken from his mother as an infant, and then sent to live with his paternal grandfather on the Big Island, where he spent the rest of his life. I don’t know whether he ever saw his parents again; his mother died when he was ten, and his father when he was fifteen. I quickly emailed the pictures to my cousin so that she could share them with her children; they are very likely the only images they will ever see of their great-grandparents and great-great-grandfather. In checking over my online tree to discover how I was related to my recent correspondent, I found new information, including photographs of my cousin’s in-laws! 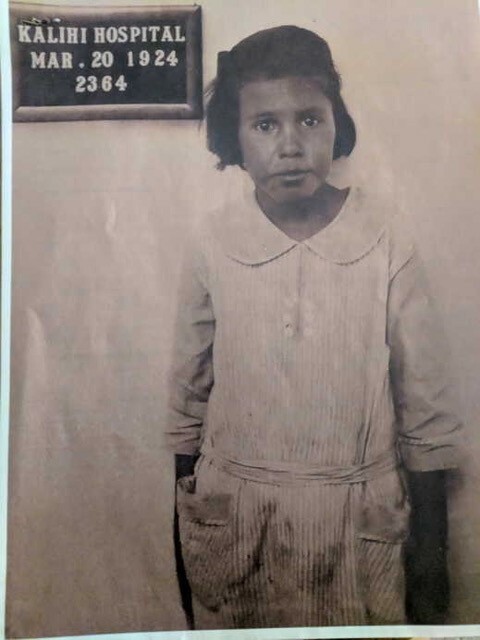 Strangely enough, someone in England was able to post their intake photos, taken when they were each brought to the Kalihi Hospital in Honolulu before being sent to the colony on Molokai. I quickly emailed the pictures to my cousin so that she could share them with her children; they are very likely the only images they will ever see of their great-grandparents and great-great-grandfather. Of course it would be lovely if the pictures had been taken under happier circumstances, but having photographs at all is little short of a miracle. 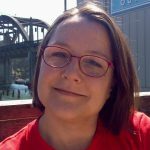 One more thing: my cousin and her daughter have done DNA testing, and needless to say, they both share many matches with me, my aunt, my other cousin, and my half-sister. But curiously enough this cousin’s daughter shares several matches with the rest of us that her mother doesn’t! Somehow my cousin’s husband is genetically related to our family. My pet theory is that he descends from Alexander Pollard Hussey of Nantucket (a distant cousin in several ways), who jumped ship and settled on the Big Island in the middle of the nineteenth century. Fourteen of his children lived to adulthood, and his descendants now number in the thousands … so that’s my story and I’m sticking to it (at least until further evidence comes to light). Flower garlands worn around the neck and/or head. Starchy paste made of taro/kalo root. Feathered standards used by Hawaiian nobility and royalty as a sign of rank. Originally they were made from the long bones of enemy kings decorated with feathers from birds of prey! Fascinating story and such serendipity for me as my book group just read and discussed the novel Molokai by Alan Brennert (2003) this past Tuesday. Anyone interested in the history of the sending of afflicted individuals to Molokai (including very young children) and removal of children born on Molokai from their birth parents should read this book. A sequel is due out this month called Daughter of Molokai. I have attempted to help my neighbor with his genealogical research for his family in Hawaii. The stories in this book helped me understand that some families moved and changed their names after having a family member sent to Molokai, making it even more difficult to track individuals. Understanding the history and events of where our ancestors lived makes genealogy come to life. Floods, tornados, hurricanes, droughts, and epidemics (like Hansen’s disease) are as influential as wars and other events which more well known to us. Serendipity indeed! Thanks for sharing the titles of these books, for those who are interested in learning more about the people who were sent to Molokai. Pamela, your stories and our family are fascinating! Thank you.